the term appears in relation to the “24” in Revelation, who are seated in the area of the upper node (see diagram page) where the throne is restored again soon; and a more contextual fragment is in Isaiah chapter sixteen [below], per definition the Lyre must relate to the same area. neither it is traceable as such in the lines describing this scene; and having learned how very punctilious those were who have written these spells, it was for a reason. 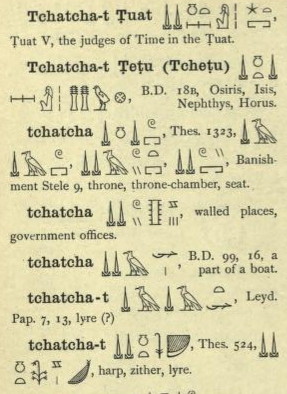 In front of the boat, just before the carpet, marches a deity holding a huge knife (not pictured here), with a name related to “to slay the word-inside for existence by the K-axis”, and this theme will return by the ‘harp’ names, below. 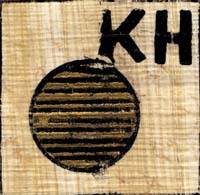 It is absolutely Un-doable to try understand the depictions and glyphs, without grasping the intended concepts — but ancient Greece showed Apollo upon the bowl holding a lyre; Rig Veda mentions similar, and also scripture: then our only option is to try see whether the spells show the same thing. linking immediately the axis with this Lyre concept. which may be the reason they wanted it so much. 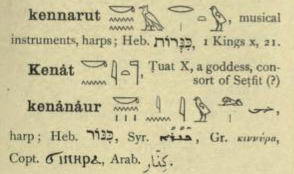 the interesting is the relation with the [only] hebrew word for harp, KINNOWR, where, above, Strong’s tells it is from an unused root – that root being completely untracable but with a lot of bending; yet the similar term appears as glyph. 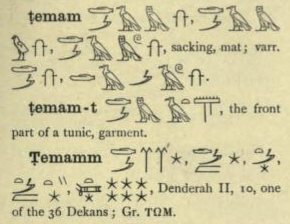 It may be coincidence (since hebrew and glyphs are unrelated), yet in several important themes, glyphs dó match – likely because of legal right. 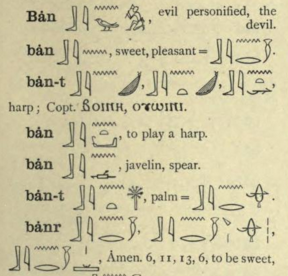 … as BEN or BENT-, ‘harp’, but now as “the lyre for existence by the solarplane”; and this BENT has the same connotations as previous: BENT-, ‘ape’, and that same ‘evil, wickedness’, but now as “the hail for existence by the solarplane”; and a similar set of links we need to look at – first as the “doubling” through BENBEN (to copulate with), BENBEN (-stone), BENU phoenix, BENÁ (now turned into ‘sweetness’ – of hail for the solarplane), etc. 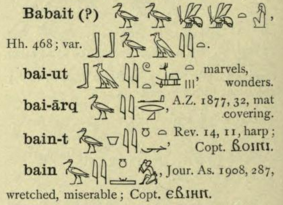 coming close now to BEB and ÁBAIT, Apollo/abaddon (at top, with deity-endglyph); the lyre may read as “the staff (wood) / (by) place-T for the word-inside / (for) the m-b-soul-adam-like dimensional-spaciousness / (of) the Ba spirit-soul”, and note the same ‘place for the word-inside’ as by the TCHATCHA, above. will perform a playout related to themes as this. the main deity of Moab relocated to India as ‘Ganesha’, the elephant-headed pot-belly [sic], it’s pot-belly and other characteristics still recognizable. Here, ‘moab’ will be a “small black hole” as Prison – somewhere…. the squeezer, H4160 muwts, “to press” [hence ‘opressor’], but perhaps as staff-ta, as fire-drill (pestle-glyph)..? We have heard of the pride of Moab; [he is] very proud: [even] of his haughtiness, and his pride, and his wrath: [but] his lies [shall] not [be] so. Therefore shall Moab howl for Moab, every one shall howl: for the foundations of Kirhareseth shall ye mourn; surely [they are] stricken. For the fields of Heshbon languish, [and] the vine of Sibmah: the lords of the heathen have broken down the principal plants thereof, they are come [even] unto Jazer, they wandered [through] the wilderness: her branches are stretched out, they are gone over the sea. whooping or shouting; an unclear concept for us, “either in battle or exitement”, but it is related to the harvest going bad, perhaps in relation to the speech (R) in REM- but now as ‘shouting’, as unadultered-eden-speech..? 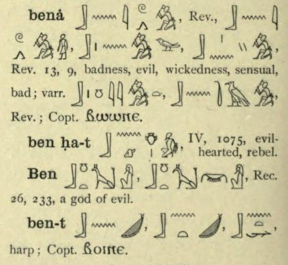 ‘bowels’ are a wrong colour here; other terms are ‘womb, heart, the breast’, but we’d suggest “the torso”, not as glyph AB- but now at the right position, namely the upper half of the lampstand. clamouring, word used in kjv as H1993, “to roar, rage, cry aloud, noise, tumultuous, etc”, compare the shouting, before; the entire sentence in present context presenting a trivial meaning – but it dóes make sense, when the ‘harp’ is again in the right place, and, fed by the Watercourse, “now roars at the Sekhet-fields” [protected by Moab – as their previous rule over the eden tile]: in order to break them all down. This [is] the word that the LORD hath spoken concerning Moab since that time. But now the LORD hath spoken, saying, Within three years, as the years of an hireling, and the glory of Moab shall be condemned, with all that great multitude; and the remnant [shall be] very small [and] feeble. three years; Isaiah was about 700BC, plus 3000 years..?